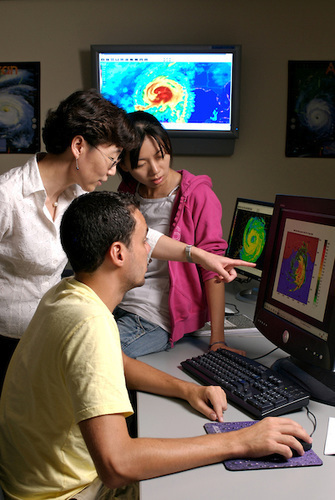 The Center for Computational Science (CCS) seeks to catalyze interdisciplinary computational science by providing intellectual leadership and resources to support the development and deployment of pioneering computational methods. Membership is open to University of Miami faculty with an interest in interdisciplinary research. Faculty members are invited to request and maintain membership in CCS through a formal application and review process. To join, please complete our application form and submit it with a current CV to ccsadministration@miami.edu. All are not required for consideration. Demonstrated interest or scientific activities in the computational sciences. Demonstrated research activity in any of the CCS Focus Areas. Active/Proposed peer-reviewed or non-peer-reviewed funding in research with a computational science component or relevance. Willingness to work collaboratively with other scientists and researchers on problems related to computational science. Active participation in CCS activities including research programs and working groups. Active participation in the CCS education and visibility raising efforts, including appropriate symposia and community education. Where applicable, willingness to provide mentoring to junior faculty and other CCS members. All CCS members will be responsible to provide information updates as required, and must be willing to share this information for the purpose of reporting requirements. All members are entitled to these benefits, pending resource availability and program prioritization. Members will have access to a community of participating scholars for collaborative interests. Members can qualify to receive funding for innovative ideas. Members can receive administrative support for grants and contracts in computational science-related research and assistance with grant submission. This information will be reviewed by the CCS Executive Committee. Membership is awarded for three years and is renewable. Membership renewal is contingent upon successful completion of an annual review. For additional information, please email us at ccsadministration@miami.edu.